In honor of the much awaited first day of Spring, I decided to make a welcoming front door wreath. Last fall I painted my door a very Feng shui Reddish persimmon colored door. I love it as I can tell friends to look for the red door. 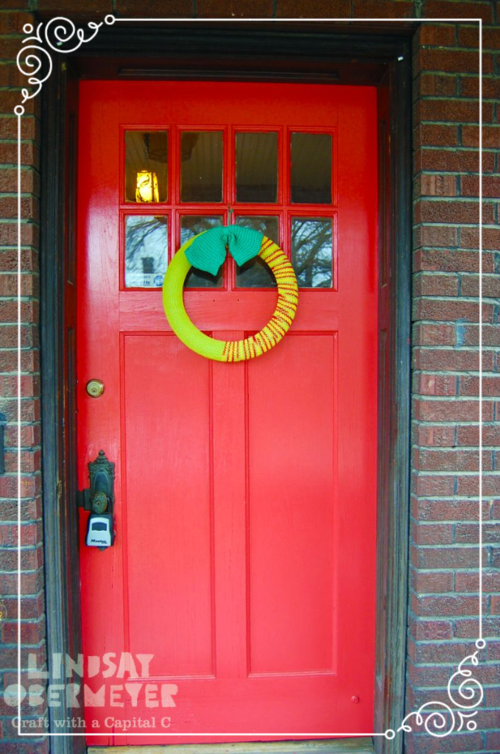 Well now I can say look for the red door with the bright green wreath! If you love to knit, but haven't made much more than a scarf, then this project is perfect for you! You are essentially making two scarves. Gauge: 4 sts to the inch and 6 rows to an inch. Begin by casting on 28 stitches with Peace. Knit the first row, Purl the second row. Continue working in stockinette stitch with odd rows Knitted and even rows Purled. When you've completed knitting all of Peace, attach Hot green and knit until you have reached 37 inches. Cast off and leave a 16" tail. Pin the top of the scarf to the wreath.Smooth the scarf over the wreath form . Pinning it in place as you go. Sew the top to the bottom once the scarf has reach around and formed a circle. Use the whip stitch to secure top to bottom and then whip stitch the scar edges together around the wreath. Remove all pins. Cast on 24 stitches with Mod Green. Knit every row for 12 inches. When completed cast off. Whip stitch together the cast on edge to the cast off edge. Forming a loop. Cut a 24 inch piece of mod green and wrap it around he center of the loop to create a bow form. Pull tight and knot. Stitch center of bow to the wreath, covering up wear the cast on and bind off edges meet. Add a loop for a hanger and attach to the door. Of course this wreath could be made in other colors for other seasons or holidays. You could further embellish it with crocheted flowers, silk flowers etc.